Many times the people in our dreams are actually there as an actor or actress to play the part of ourselves. We might have a dream that features a friend or family member, but this does not always mean the dream is about them! Sometimes these people appear in our dreams to show us how we might be balancing our current responsibilities and roles in life. Often times these people are symbols for our own feelings and actions. When we have a dream about people, it's very helpful to think about whether these people may be playing the role of ourselves in a dream. Once we understand that these people may be symbolizing our own feelings or actions, we are ready to better understand the symbols in the dream. What Part of Me Does this Person Represent in the Dream? In order to understand how a character in a dream might represent you, the dreamer - it helps to know a little bit about the ways this might manifest in a dream, and what it might actually refer to. ￼There are 4 key parts of self we can identify in our dreams. These are the physical, mental, emotional, and spiritual aspects of self. When we dream about someone, often times there will be clues in the dream to tell us what part of ourselves the dream might apply to. The physical self relates to our physical bodies and our physical connection to the world. The physical self involves health and well being, our feelings of safety and security, and having our physical needs met. 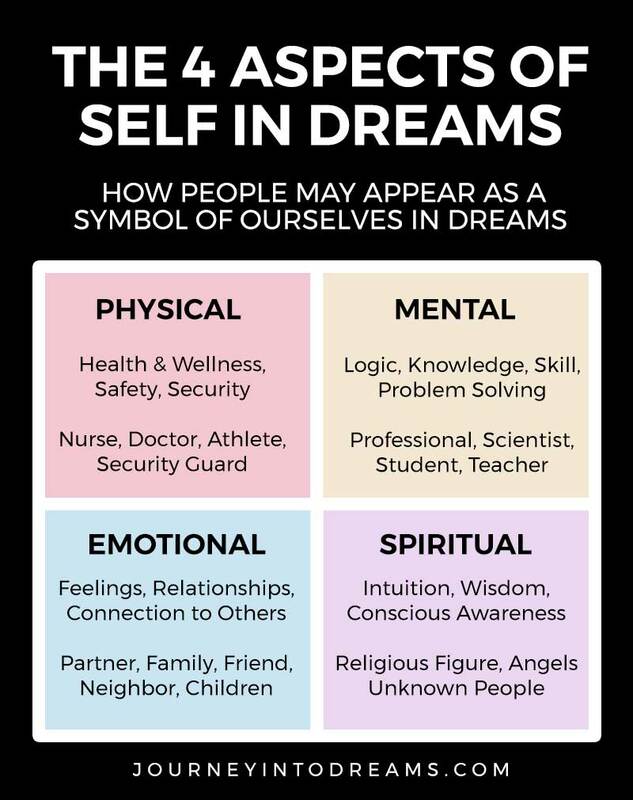 Some common clues that a dream might relate to your physical self is if the person you are dreaming about has a job that relates to health, safety, security, or is physically demanding. The mental aspect of self encompasses logic and reasoning, the ability to problem-solve, knowledge and skill. It also influences our attitudes and perception of the world. This part of us experiences life fully through emotions and feelings. It gives us the ability to connect with others to form relationships and experience intimacy and understanding. The spiritual self is our higher self, our soul, our essence of being. It is what gives us meaning and purpose in life and connects us with the source of the universe. Awareness of your spiritual self can help develop intuition as well as help develop all other aspects of self. Once you understand how the people in your dreams may represent the various parts of self, we can break it down even more into various roles/aspects of our lives. Yourself as a Family Member: Daughter/Son, Brother/Sister, Grandparent, Cousin, Friend in a Family Role, etc. Your Creative Self: Artist, poet, writer or muse. Your Spiritual Self: Member of clergy, or renowned religious figure (Jesus, Buddha), etc. Working with these different roles and characters can provide a lot of insight into inner struggles you are facing, as well as various thoughts and emotions. In order to understand how we might dream about people that actually represent ourselves, I think it is very helpful to use an actual dream and its interpretation. Dreams are always very personal in nature, and often times we really are the best people to know what a dream might be about. In this dream interpretation example, I will share the dream and the steps I took to understand what it means. Title of Dream: "You Ruined Him for Me"
Dream Plot: My former co-worker and I were dating in the dream. In real life, we never had any romantic connections. In the dream, we broke up and then I introduced the former co-worker to a friend from high school. He was not attracted to her however, so they did not end up dating. She said to me, "You ruined him for me. You were too good." Character Associations: My former co-worker was very professional considered one of the best in the industry. The friend from school on the other hand was an emotional wreck - I remember many days at school where she was crying or very needy. The former co-worker is easy to spot as an aspect of my mental self/career role in life. In my current work at the time, I was working overtime with insane hours. I was putting in a lot of effort, and really going above and beyond on the projects I've been working on. At first I had no idea what the friend from school meant - she was not someone I had kept in touch with over the years. However, once I thought about what I associated her with and described her as being emotional and needy, it became immediately obvious that in the dream she symbolized the emotional part of myself. Dream Interpretation: Using the associations with the characters as a part of self, I can interpret the dream as this: My professional self is "ruining" my ability to tune in to my emotional needs. In my life at the time, I was so consumed with doing my best at work, I wasn't giving myself time to think about my emotional needs or how this impacts my day to day life. The fact that these people were from the past helped me recognize that this was a repeating pattern from past events - I had a habit of working to the point where burnout would be inevitable. This then would cause a cycle of "ruining" a lot of things, especially by putting on additional stress on my current real life relationships. Resolution: For me, this dream to me was clearly a sign that I needed to take a break from work and try to find a healthy balance. After this dream, I took a good look at what was currently happening in my life. I decided to take a few weeks away from all professional and business projects and focused on spending time with the family and taking time for some very much needed self care. It's not always easy to understand people in our dreams as being a part of ourselves, but I hope that this example and these tips will help you understand what the people in your dreams might mean. 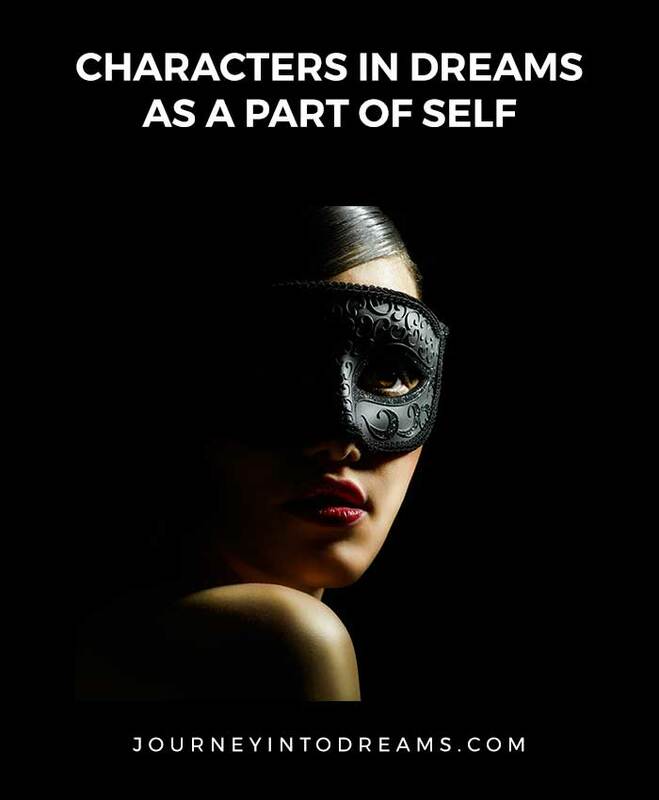 Often times if we see them as characters and think about our own personal associations we can very easily understand our dreams and use them to help us live our life to the absolute fullest! Do you have a dream where you think someone you dreamed about might have been there as an actor to play a part of yourself? Do you have any questions on dreaming about different people? Share your experiences and thoughts in the comments section below. « People in Dreams: What Does it Mean to Dream About Someone?